Vincent at one of our morning visits for coffee and conversation. Vincent first became homeless in 2016 - he was laid off from his job, couldn’t make ends meet and ended up at Austin Street Center. Walking into the shelter with Vincent feels like walking the halls of high school with the popular kid - everyone stops to say hi, make jokes, and catch up. Vincent has an uplifting energy, radiant smile, and infectious laugh that people are naturally drawn to - he’s an easy person to be yourself with. On July 11, 2018, after working at the Adessa Car Auction all day, Vincent went to the hospital complaining of pain in his foot. The doctor quickly identified gangrene under his big toe that had already spread up his leg. His leg had no blood circulation and was swollen. The doctor informed Vincent that he would have to amputate below the knee immediately to save the rest of the leg. 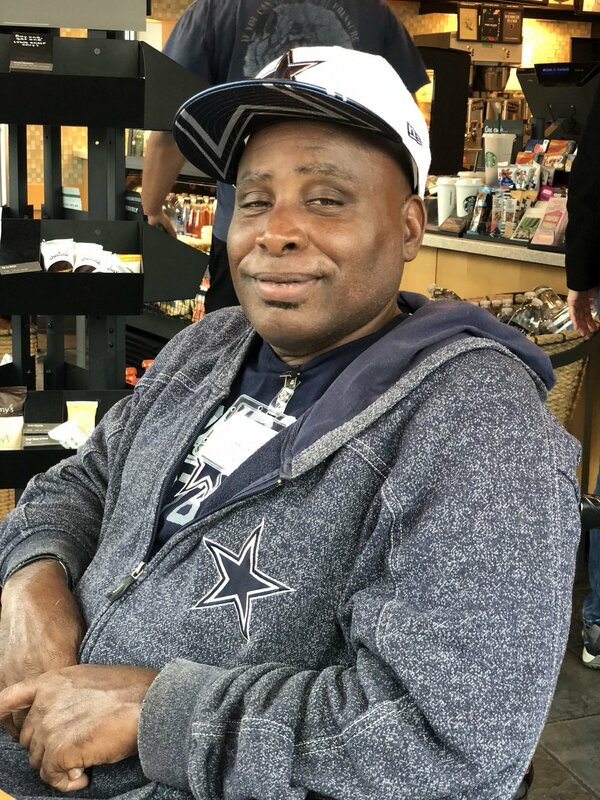 After his emergency surgery, Vincent spent 10 days recovering in the hospital and was then discharged back to Austin Street Center. Some of the challenges Vincent faced once he was back at the shelter included difficulty getting dressed, changing his bandages and cleaning the wound, learning how to maneuver his wheelchair inside the shelter and outside on the streets. Vincent also experienced several falls while back in the shelter as he learned how to rebalance with one leg. Transitioning from wheelchair to his bed and to the bathroom proved to be big challenges in his new daily routine. In addition to all this, he was trying to manage the pain from both the surgery and the very real phantom limb pains many amputees experience. Mike and Elisabeth advocate for Vincent at one of his follow-up appointments from his amputation. When we met Vincent in August, you wouldn’t have known that he was recovering from an amputation that had occurred only the month before. He was smiling, warm, and didn’t complain. It wasn’t until the next week that we started to connect the dots. His amputation was still fresh and he was already back at the shelter… How was he keeping his wound clean? Where was he getting the necessary follow-up care? Elisabeth decided to call the hospital to get an understanding as to why Vincent was back at the shelter rather than in a rehabilitation facility. We spent the next few weeks were advocating for a better situation for Vincent. Educating his medical team about the conditions at shelters and the inherent challenges of healing while homeless. Arranging for a medical bed at the Salvation Army, where Vincent is currently staying. The Salvation Army Shelter allows Vincent to access medical care just across the street and healthier food for his diabetes control, a vital component in the healing process after his amputation. Spending many hours taking Vincent to get paperwork necessary for his application for Social Security Disability Income (SSDI). This paperwork process included many more doctor appointments, trips to Health and Human Services, and the Social Security Office. Accompanying Vincent to his follow-up appointments to advocate for a better wheelchair that could handle moving around on the streets. Helping arrange wound care and physical therapy appointments that would put Vincent on the path to getting a prosthesis. Helping get a walker and crutches for Vincent to use as his balance improves and he learns to move around better. These are just some of the real needs that your generosity at our 5 Year Celebration enabled us to meet. Our work is simply impossible without the support we get from our incredible community. We are so thankful for you! Vincent’s Social Security Disability Income is pending. Physical therapy is going great! He’s getting stronger and is on his way to getting a prosthesis. Some of the paperwork we helped take care of led Vincent to be approved for a semi-private room at the Salvation Army. Vincent reconnected with his son, who he hasn’t seen in 19 years. According to some of his friends, Vincent is the happiest he’s been in a long time. We enjoy seeing him regularly to catch up and just be friends. THANK YOU for helping make these developments in Vincent’s life possible. If you are interested in helping make more of these stories possible, consider supporting us financially by donating to our "Meet the Need" fund. Vincent enjoying our 5 Year Celebration on September 6 with Brett, Willie, Mike, and Elli.